Finally…the rain has stopped. Temperatures have grown increasingly mild. My vacation began Monday or perhaps to be more precise it began at 5:01 PM the previous Friday. Rain, dark skies and cold temperatures were my constant companion since my vacation began. I checked the weather on my iPhone over the past week. Thursday was the only day which looked even remotely nice. When the skies remain gray for as long as they have, I begin to feel depressed. Getting up and running is usually not difficult but doing much of anything else becomes a major chore. A chore which I have little interest completing. Last night I put my gear together, loaded the boat on the car and loaded my paddling gear into the back of the Element. Morning came. I donned my wetsuit, climbed into my car and drove to one of my favorite put-ins. I slipped into my boat and quietly pushed off. Shore became a distant memory as the bow of my boat silently passed through the water leaving a small wake; a brief memory of my presence. I began to tune-in to the song of birds as they accompanied the sound of each paddle blade as it entered and exited the water. Aside from the preparation to paddle, paddling is as relaxing as running. I pointed the bow of my boat West toward Lockport. I lightly gripped my paddle and quickly fell into a rhythmic stroke. After paddling twenty-minutes I came across the entrance to a smaller creek. When I desire more relaxation than exercise I exit into this shallow, narrow watery path. I paddled past several geese protecting their goslings. The parents honking to make me aware of their presence and cautioning me not to come too close. As I continued to paddle I passed several turtles who took from their perch on a log where they had been sunning themselves and silently slid beneath the surface of the placid water. As I rounded a bend in this narrow creek, I became increasingly aware of the sound of automobile traffic. I had not recalled when that sound had left me. I strained my ear and smiled. The sound of automobiles had been extinguished. What now accompanied this great outdoor symphony were the various animals which call this place their home. As I continued to paddle my eyes began to dart from one bank to the other; left to right, right to left. I raised my paddle so it no longer made contact with the water. I cradled my paddle across the cockpit of my boat. I unlatched an exterior pocket on my PFD and withdrew my camera. 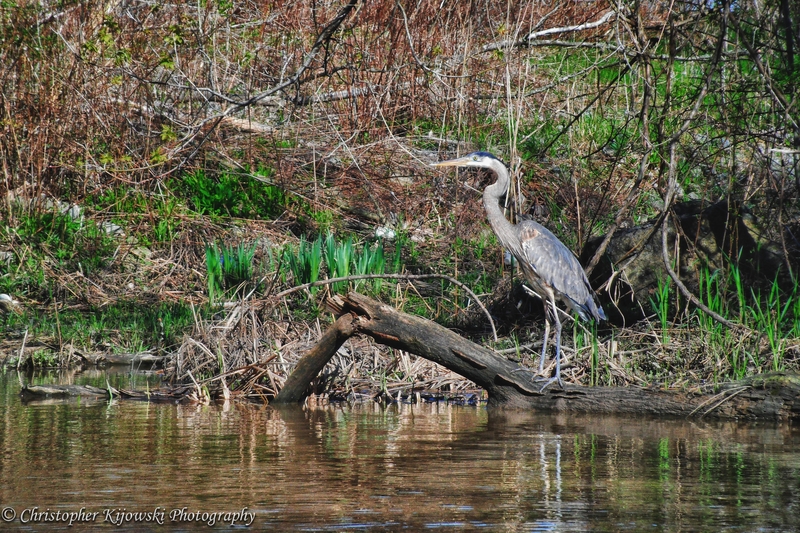 What lie ahead was the object of my affection, a great blue heron. He stood like a silent sentinel on the shore. He remained motionless watching me with great care. As my presence grew closer and increasingly intimidating, he spread his wings and took flight. These birds are amazing to watch; their large wingspan reminiscent of something from the Jurassic period. The large wings, slowly flapping make only the slightest sound. This great bird disappeared overhead. In a flash he was gone. I pocketed my camera, picked up my paddle and dipped each blade. Satisfied I was ready to return home.